"Projektbild für Sechste Schornstein in Münsterland"
Oil on c-print mounted on aluminium, 60x74 cm, 2000. Finished work. In July 2000 JS was invited along with 20 international artists to participate in the Skulptur-Biennale Münsterland 2001, curated by Christoph Tannert. 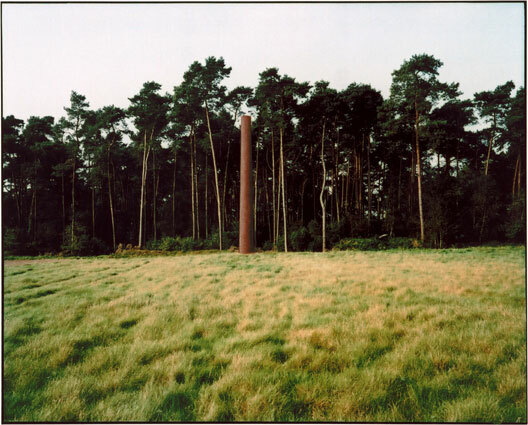 After a number of excursions by car, JS chose a site close to the village of Hembergen, in the vicinity of Emsdetten, as an "ideal site" for the Sixth Chimney. (Map). The project was accepted for realisation by the exhibition jury, after which followed negotiations with the owner of the land. Construction took place in May 2001. The exhibition opened on July 1. Site indicators: photo 1, photo 2, photo 3, photo 4.